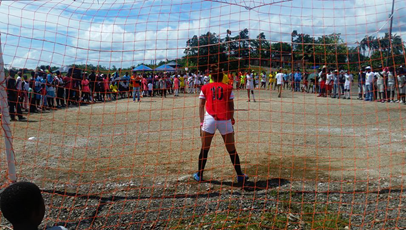 Hundreds of people gathered in the community of Isla de Paz in Colombia’s port city of Buenaventura this Sunday for the finals of the youth football tournament Show Dispossession the Red Card: Let’s Play for our Territory. The tournament has brought together boys and girls from communities which are resisting pressure from the Colombian state, national and multinational companies, and paramilitary groups seeking to displace them from their territories. All of the communities participating in the tournament are faced with the threat of displacement by a series of infrastructure ‘megaprojects’ - large scale developments which revolve around increasing port capacity and tourist infrastructure in the city, but which ride roughshod over the rights of the afro-descendent communities which have lived in Buenaventura for hundreds of years. Despite facing violence, denial of basic services and aggression measures from government officials and companies involved in the port expansion, communities in Buenaventura continue to organise and resist in defence of their rights to remain in their ancestral territories. In response to this situation, and the increasing targeting of young people for forced recruitment and physical violence, the Inter-Organisational Committee of Buenaventura (an alliance of community groups, social movements, trade unions and UNISON Northern’s longstanding partner the human rights organisation Nomadesc) organised the ‘Show Dispossession the Red Card: Let’s Play for our Territory’ tournament. With 14 teams participating, over 215 boys and girls from across the worst affected areas of Buenaventura not only engaged in friendly competition, but also participated in workshops which encouraged them to engage with the situations faced by their communities, and to identify with their communities’ struggles to remain in their territories.